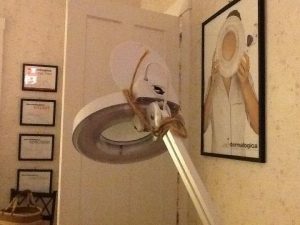 One of the most frustrating things to me as a skin therapist has been in finding a QUALITY magnification loupe that won’t bonk my clients in the face or make those awful creaking noises when moved. I was so sick of my magnification loupe that I recently started using magnification lenses, but I’ve been challenged in finding a set that won’t fall apart after just a few uses. All of the products I have used until now were cheapies that I bought on Amazon or eBay and were made in China. They lasted about as long as you’d imagine…. Yes, that is my actual magnification lamp that I temporarily fixed with twine. It broke RIGHT before my client was due to come in!!! True to form, I started my search, and here is what I have found! The Vario comes with a steel clamp that I have attached to my 7-in-1 machine. The ergonomic lens easily rotates in several different directions for ease-of-use, and the 2.9″ aspheric* lens is coated with the patented cera-tec®, which protects lenses from scratching up to 90% better than other lenses on the market. 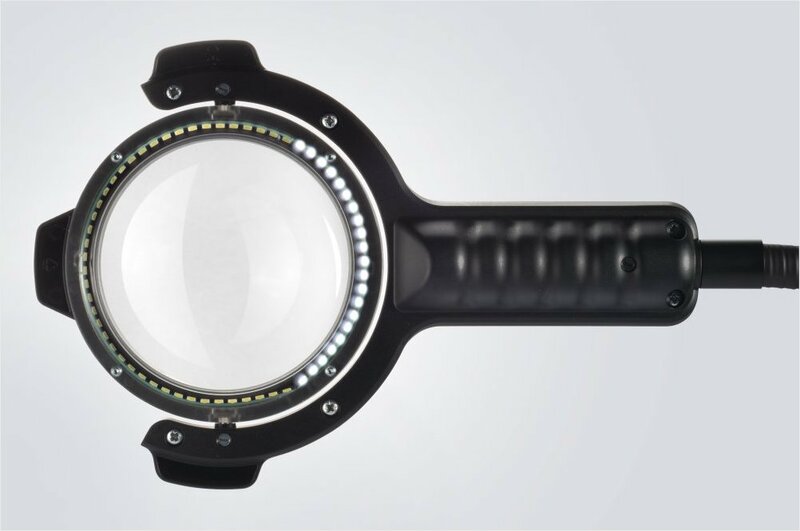 The lens is surrounded by 63 LEDs with 2 brightness settings – a high power setting that is shadow free, and a low power setting. The LEDs are rated for 50,000 hours. A microfiber lens cover / cleaning cloth is included, and an 8-foot power cord will free up your closer power strips for other equipment. * Why does the type of lens matter? 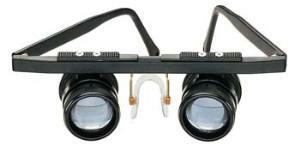 Most magnification lenses are a biconvex lens. These lenses are curved on both sides which creates noticeable distortion around the periphery, which in effect, decreases the amount of lens you can actually use for your particular task. Aspherical lenses, on the other hand, are curved more on one side than the other which results in minimal distortion around the periphery, thus increasing your working area. It also offers the highest power range. 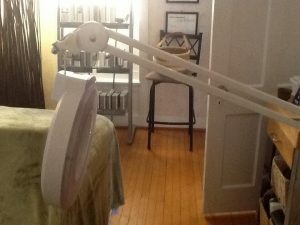 For those of us that have a smaller treatment room, or are just more comfortable with wearable magnification, I found some AMAZING magnification specs! The Galilean Telescopes are available in a 10, 12 or 16 diopter (this corresponds to 2.5X, 3X or 4X, respectively). The achromatic lens is actually 2 lenses, one concave and one convex, designed to limit the effects of chromatic and spherical aberration. 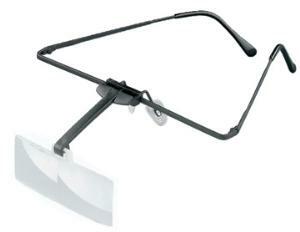 It offers good clarity and true color, and is used in most jewelers loupes. This is the style that is most often used by dentists for clear, close-up, detail work. (Sound familiar?!) They come with a FIVE YEAR WARRANTY and a 30 day evaluation. If they don’t work for you, you can return them and just pay shipping cost. If the Galilean Telescopes are too spendy, I do have another option! The Clip-on lens system is pretty cool! It can be worn by itself or over your prescription lenses! It comes as a lightweight black metal frame (NO PLASTIC!!) 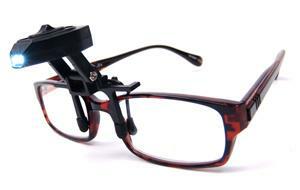 and separate lenses, so you can customize for the magnification you need. Choose from 2.8, 4, 6, 8 or 16 diopter, aspheric lenses (1.7X, 2X, 2.5X, 3X or 4X, respectively). The lens clip element is made of glass fiber with reinforced plastic, and is easily adjustable using the quick snap closure. The same cera-tec® coating helps to protect your lenses from scratches. This system comes with a limited one year warranty from the manufacturer. One pair of lenses I recently used is 10 years old! 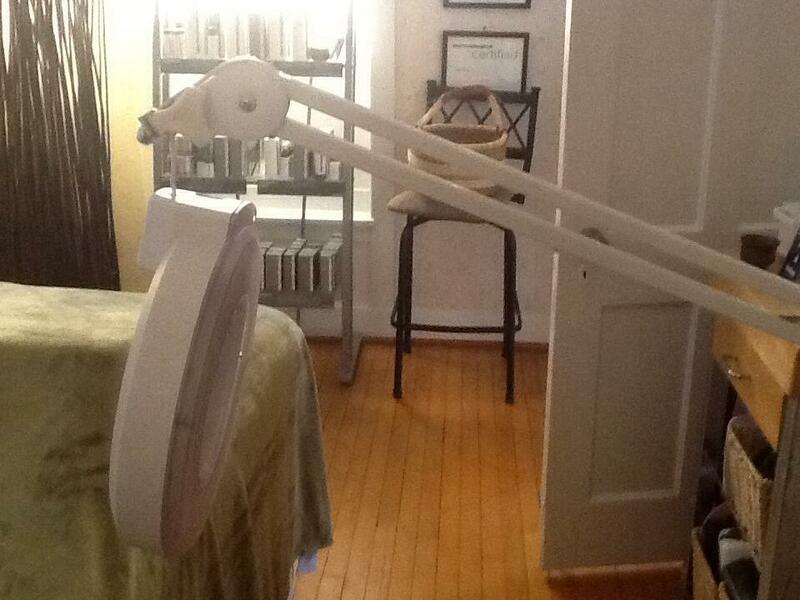 This is a pair that is used FREQUENTLY for ThermoLo treatments! If you really can’t choose which lenses you might like, or you have multiple therapists using the Clip-on lenses, you can also choose the Clip-on Diagnostic Kit. 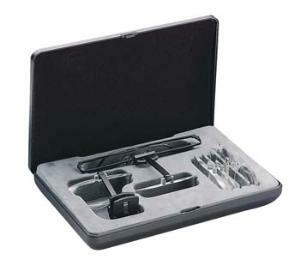 This kit comes with 8 pieces and is designed to provide the user with a complete set of binocular and monocular clip-on lenses and two different lens-holding mechanisms for many different magnification needs. The lenses are once again aspheric and coated with the cera-tec® for many years of use. Wait – you want to actually be able to SEE what you’re seeing?! Check this out! 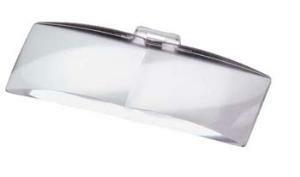 The SpecLight is unique clip-on light featuring in a clever design that attaches onto the bridge of your glasses. Its purpose is to provide additional illumination when none or not enough light is available to complete the specific task at hand. 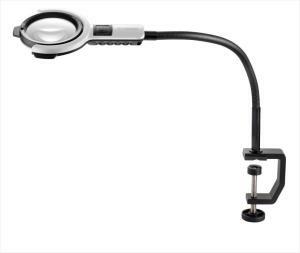 The SpecLights utilize two bright LED lights in broad beams that last up to 50 hours, a light-weight, adjustable clip mechanism with rubber-coated ‘legs’, that tilts and can be positioned to view objects at any viewing angle. The rubber-coated ‘legs’ ensure the wearer’s lenses and coating will not be scratched by the mechanism, so users can use it with confidence. The brightness is adjustable – there is a two-step on/off switch that allows the user to use one or two of the LED light beams, which increases energy efficiency. SpecLights require only 2 coin cell Lithium batteries (included) which provide 30 hours of illumination! There are two extra batteries are included in the case, providing an additional 50 hours of illumination, and a black, crush-proof, protective clam-shell case is included with the purchase of SpecLights. 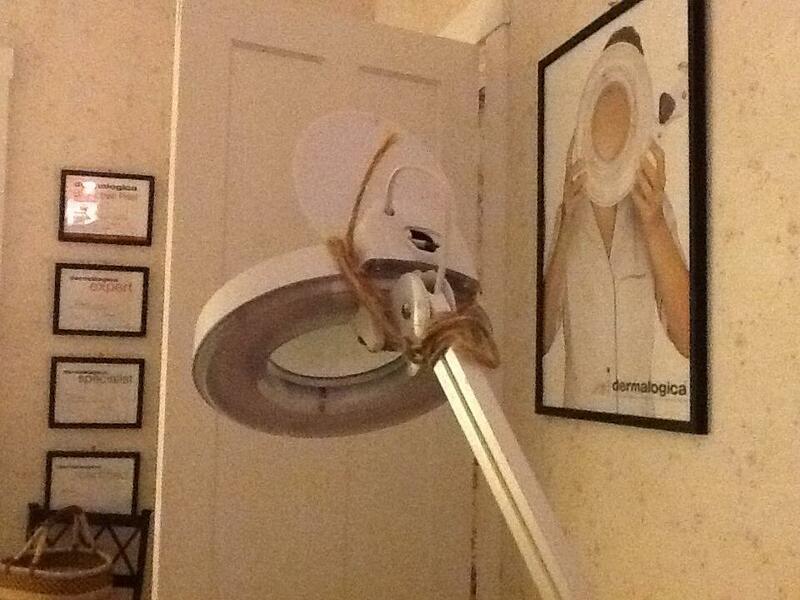 I hoped this helped to ‘shed a little light’ on your search for quality optics for use in the treatment room! (Ha! I crack myself up!) You can shop for any of these items by clicking HERE!